Our appellate experience is impressive and extensive. We have a long list of published opinions in state and federal courts, many of which involved cutting-edge issues that established new law in areas that had not previously been addressed by the courts. In a large number of these, the courts adopted rules that were literally created by our firm to fit the circumstances of the case and the needs of our clients. Our most recent appellate victory was in the Colorado Supreme Court, in a direct appeal to overturn an order granting a new trial entered by a trial judge after the firm successfully defended a fatal airplane crash. We filed two separate appeals, and prevailed on both of them, preserving the jury verdict in favor of our client. In an earlier appellate victory, Godfrey | Johnson, P.C., prevailed in a federal appeal before the 9th Circuit U.S. Court of Appeals in San Francisco in a class-action following a successful result we achieved in a jury trial in the Northern District of California. Read more > or Listen to Oral Argument. Our most well-known cases are Barton v. Adams Rental & Sales, Inc. (product liability); Copper Mtn. v. Poma of America (comparative fault, contribution and settlement agreements); Cuny v. Vail Associates, Inc. (enforceability of releases); and Midwest Mutual v. Murray (interpretation of insurance coverage). 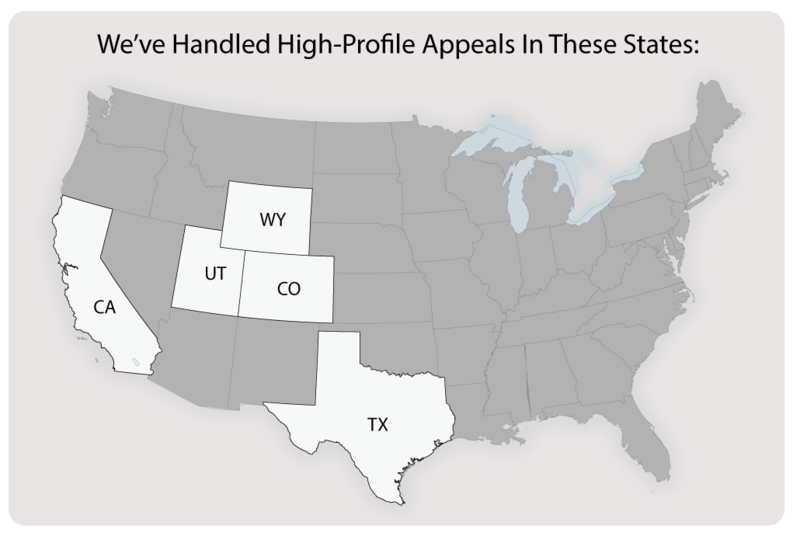 In addition, our legal arguments in federal court have produced a number of published district court opinions, principally on evidentiary and procedural issues, that are cited and argued by lawyers throughout the states of Colorado and Wyoming. When we represent a party on appeal, which happens after one of our own trials is appealed or when we are retained to handle the appeal of a case tried by another firm, we study the record thoroughly for references that will support our client’s position. A commonly held misconception is that appellate lawyers and trial lawyers are fundamentally different. While it is true that many attorneysspecialize in only one or the other of these two areas, we have found it to be very effective to develop skills in both fields due to the overlapping needs for understanding demanded in each practice. For example, an attorney who is not experienced in the appellate process is often likely to misunderstand the precise nature of a record that is needed in a given circumstance. Similarly, an appellate lawyer who is not versed in the rules of evidence and civil procedure (as a trial practitioner must be) will often fail to understand key appellate principles that are not engrafted into the black-letter substantive law of a given kind of case. By their very charter, appellate courts are interested more in the law than the facts or evidence in an underlying case. Sufficiency of evidence and foundational or evidentiary errors in a trial are often cited as grounds for appeal, but the ultimate merits of a claim rarely control the outcome of an appeal. On the contrary, the mechastic legal thinking of the appellate court is often misunderstood by trial attorneys and parties alike. Therefore, in order to be effective as legal counsel, the key is to be capable of thinking and operating on more than one “wavelength” of legal thinking simultaneously. When we seek to sustain a result, of course, the job is statistically much easier, but if we seek to vacate a judgment or alter a result, we must develop our “theories of error” with surgical care. When the record is made at trial by legal counsel experienced, as we are, in appellate law, the appeal is made much easier and more effective. It is imperative that trial counsel have appellate experience, just as it is extremely useful for appellate counsel to be experienced trial lawyers. Appeals are about judicial precedent rather than the merits of an individual case. The mind-set of the appellate courts is drastically different than what is brought to bear by juries or trial courts. It is often surprising to clients to learn of the rarified and limited analysis an appellate court is willing to apply to a case, as laypersons often think that the purpose of the appeals court is to overlook the entire case to make sure that justice was done—and this is simply not how the appeal process works. The first question we analyze in developing or defending an appeal is whether we are trying to invoke existing judicial precedent or, instead, to modify or create new precedent. The approach to an appeal constitutes the first part of a very surgical and orderly analysis of the legal issues to be advocated in this upper level of the court system. The function of the appellate courts is to review the record for errors of law, and appellate courts employ this process as a means of weaving a tapestry of laws, subject to the mandates of the legislative branch of government, to set forth the public policy adopted by the court in question. This public policy is often the driving force behind the judicial acceptance or rejection of a given theory of error (the basis of an appeal), and must be understood and used in order for appellate briefing and oral argument to be effective. When we advance an appellate position, we perform careful legal research and develop ways to persuade the appellate courts to adopt or apply laws in light of this overall function. We never lose sight of the “big picture” that the appellate courts are working to develop as each new decision is announced, much like laying bricks in a wall, to provide a harmonious legal structure. The specific legal precedent we are seeking to invoke or to make is advanced in light of the best interests of society as a whole and the legal system specifically. Argument in this fashion has proven to afford the best likelihood of success to clients, provided the citations to law and the record below support the argument and the argument is well structured and saliently presented. This additional dimension requires a level of appellate sophistication that frankly exceeds that of most qualified trial lawyers.